The VIP Retail Pet Identification Program is the newest, easiest and most affordable way to meet your customer’s immediate demand for pet identification, whilst providing you with a new and highly profitable revenue stream for your stores. 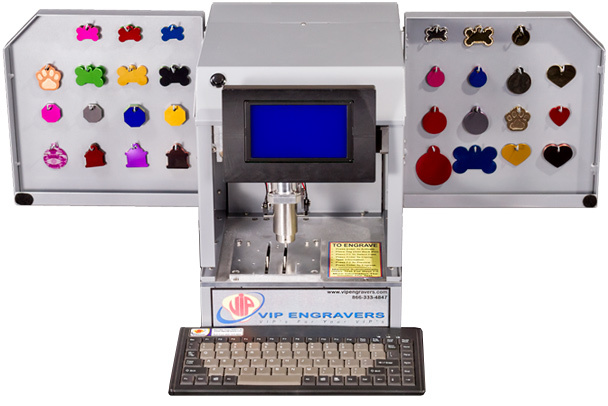 The VIP Program was developed with you, the retailer, and your customers in mind and features the Patented VIP CE-1000 allowing you to instantly provide your customers with the highest quality engraved ID Tags, ID Collars and other engravable Products available. The Patented VIP CE-1000 computerised engraving system was engineered for durability and designed for ease of use, virtually eliminating the need for any field maintenance and employee training. Just plug it in and your ready to go! Contact us today on 07941 264291 for more information. Our exclusive line of ID tags are 20% thicker and significantly stronger than those currently being offered by others and are available in the most popular shapes and colours. Our exclusive line of ID collars, only available from VIP, feature an engravable plate permanently embedded in the collar (not just riveted to the top) that you customize in-store using the CE-1000. 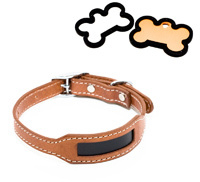 These collars provide your customers with the most permanent means of pet identification available. Speak to a member of the team on 07941 264291 for further information about our product range.